Our hygienists are very thorough and always take the time to explain procedures. 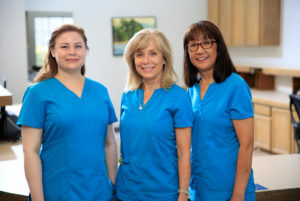 Our excellent team of hygienists not only help Drs. Hendry and Henriod with treatment of severe gum disease, they also provide deep cleaning for mild to moderate gum disease. Each of our hygienists are highly trained and experienced in all the deep cleaning techniques and procedures. All our hygienists have been with us for many years, working side by side with Dr. Hendry and Dr. Henriod, and have seen and treated a full range of periodontal disease. 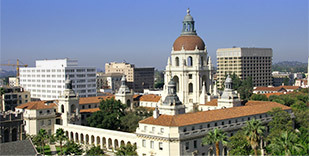 They are highly trained in periodontal disease education and treatment, and in fact, train other hygienists. Deep cleaning is another name for scaling and root planing. It is needed when gum disease has moved below the gum line into pockets created by the gum detaching from the tooth root. Our hygienists know how to get deep into the pocket to effectively clean it out, often eliminating the necessity for further, more invasive treatment. Scaling is the action of removing plaque (a sticky film of bacteria) and tarter (calculus), which is hardened plaque. We use ultrasonic scalers that gently remove the plaque and tartar with sonic vibrations. Root planing is the action of detailed scaling of the root surface using curettes (hand instruments) to smooth out any rough areas and remove any residual tartar. For gum disease treatment to be successful, it is vital that the root surface is left smooth. This encourages the gum to reattach to the root, closing up the pockets that have been fostering the further growth of bacteria. The curettes also act to remove the diseased inner lining of the gum pocket. For deeper pockets, the doctors use special rotary instruments. We offer our expert and thorough deep cleaning as a service to any patient with gum disease. If we think patients with moderate to severe gum disease have a good chance of avoiding surgery – laser-assisted or traditional – we start their periodontal treatment with deep cleaning. As our deep cleaning treatments are so thorough, in many cases we can fully handle the dangerous stage of periodontal disease through this procedure alone. 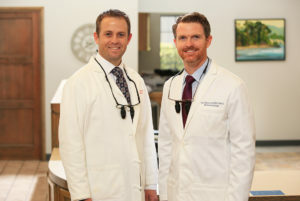 Dr. Hendry and Dr. Henriod also perform deep cleaning at the same time as laser-assisted therapy for severe gum disease. In some cases we will use a laser to eliminate remaining bacteria and to remove infected tissue. We also use antibacterial rinses, or, for more persistent gum disease, DNA-specific antibiotic therapy. Without good home oral care, even the most thorough periodontal treatment can fail. Our expert hygienists work with you on how to be most effective with your oral hygiene. They will show you how to brush your teeth without destroying your gums. They will teach you about the different oral hygiene tools available, such as water picks, types of tooth brushes, types of floss and about small brushes (proxy brushes) for small spaces.